The Nike Roshe Run has been written about in a clutter of enthusiastic paragraphs and run-on sentences on here at least five times in the last year, but it’s an important shoe. While all eyes are on the Nike Flyknit uppers, the last restock of the Iguana colourway of this shoe flew out in a matter of hours. Any new design that makes powermoves without a digital marketing campaign is something deserving of respect. Light, comfortable and versatile, the Roshe is a shoe that captures a moment. We couldn’t get too excited by the beefed-up trail editions and we never quite understood the addition of any extra panels, but these city-themed Quickstrike Nike Roshe Run Mids are okay. Nike’s going in with the city collections (the HomeTurf Air Max collection next weekend is going to break the internet in the question for Milan’s AM1) this season, from Lunar Force 1s to every kind of Max variant, and these rep for NYC, London, Tokyo and Paris with the subtle shifts in sole unit, accent colour to represent each locale on the heel and lining, plus a contrast between a light but rugged mesh and a denim-style overlay. There’s no daft literalism to ruin the formula with excessive embellishments. They don’t touch the OGs for immediacy, but these aren’t too busy in their executions, which makes these some of the better makeovers of late. 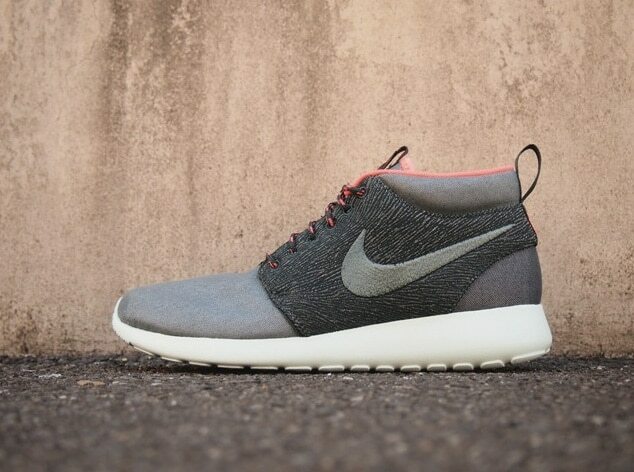 The NSW Roshe Run Mid City Pack goes on sale in the Crooked Tongues store this weekend. New Balance UK-made M1500GYB & M1500EBN: Lake District tech running. The New Balance M1300CP still breaks the bank.